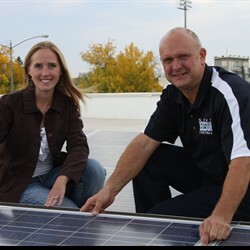 The Great Falls High School Solar Project was made possible by donations from NW Energy's USB Grant, Kiwanis, the Uptown Optimists, Great Falls Public Schools Foundation, a One Class at a Time grant from KRTV & First Interstate Bank, and energy conservation fund savings. The installation of this innovative project was completed by Cascade Electric. Our array boasts seventy two 235 Watt panels split between the lower and middle roofs. The system was envisioned and pursued by two teachers, Dan Wilkins (IT) and April Senger (Science), with the goal of preparing students for 21st Century learning. An additional benefit includes the cost savings to our district. The Great Falls Public School District gives our most sincere thanks to everyone who contributed in providing this educational opportunity to our students.